The founders of Croydon Tech City (CTC) have given up the fight to keep their startup hub alive. Since 2012, Nigel Dias, Jonny Rose,and Sarah Luxford (l to r above) have been running the project on a voluntary basis but, despite considerable success, they have not found anyone willing to invest in future developments other than Croydon Council and local companies. CTC opened just over a year after the Greater London riots of 2011 which saw local buildings burn and shops looted. Croydon’s image was badly tarnished and the nurturing of startups gave hope for the future and has been, as Dias said, a major force in improving the town’s reputation. In 2015, the Mayor of London Boris Johnson described Croydon as an “economic powerhouse in south London” and the following year Matt Hancock, Cabinet Minister for Digital, described the hub as “a blueprint for the future”. CTC has been lauded by local politicians of all parties and commercial brochures promoting Croydon as a business centre often cite the local tech sector as an example of how forward-looking the London borough has become. As the old adage goes, fine words butter no parsnips and the success of CTC has taken its strain on the volunteers heading the group. Under their guidance, mentorship for startups bolstered by regular meetings and talks have been organised, several workspaces offering reasonable rates have opened in Croydon, and the promotion of the hub has been tackled with verve. The Office for National Statistics rated the borough as the capital’s fastest-growing tech cluster with more than 1,500 related businesses especially in the games industry, data storage, and file-sharing management sectors. Croydon has been seen as an outpost of the ‘real’ Tech City – an urban country cousin. If this can happen within the M25, what hope has the rest of the country got? Grandiose schemes with iconic names, such as the Northern Powerhouse, have been promoted vigorously but the cracks may be beginning to show. 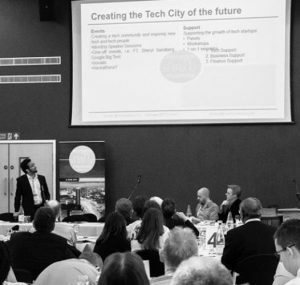 Whether Tech Nation (the merger between the, mainly, government-funded Tech City UK and Tech North) will have a re-balancing effect remains to be seen when the new quango starts operating next month.